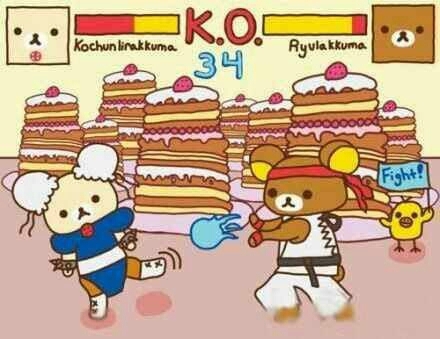 Street Fighter Rilakkuma! | Angel's Rilakkuma Blog! We have Korilakkuma as Chun Li and Rilakkuma as Ryu! How clever are those names? Looks like my precious Ko-chan is losing, though =( love the pancake theme and Kii cheering them on! This entry was posted in Uncategorized and tagged capcom, hadoken, Japan, kawaii, kiiroitori, korilakkuma, play station, rilakkuma, san-x, SF, street fighter, Tokyo, video game, Xbox by Angel. Bookmark the permalink. Love it! Lol. Kori’s ears are the Chun Li buns. So cute!!! Ha ha how cute! Everything is perfect, I’m sure shell bounce back at the last second. The pancakes are an awesome touch.